Airline threatens baggist with "necessary steps"
Cape Verde airline TACV doesn't like its logo appearing on Januscz Tichoniuk's bag collection website. The airline has threatened the Polish baggist with "all necessary steps" if he does not remove the logo. Strange that the airline is concerned about its corporate identity in eastern Europe: TACV does not fly to Poland. And when bagophily.com's team of investigators visited the carrier's website, it was down: "Server does not exist or access denied". Maybe the airline's executives should focus more on its online availability to potential passengers, and less on people who steal its bags? In a gesture of solidarity with Janusz, we reproduce the TACV logo on the left. TACV is not the first bag purveyor to threaten a baggist with legal action. 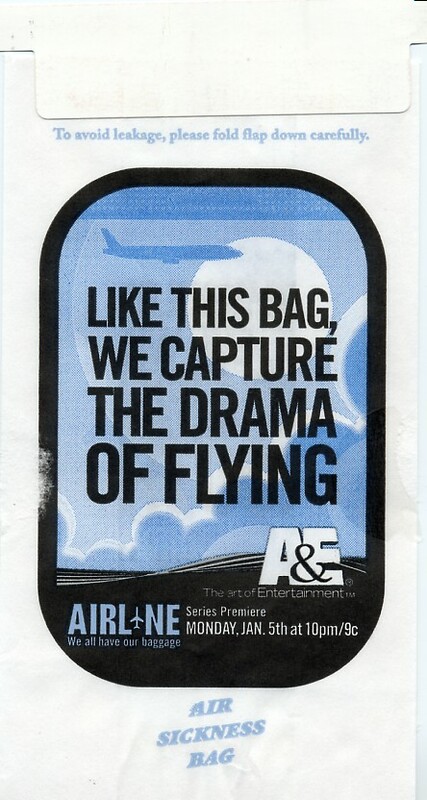 Airsicknessbags.com proprietor Steve Silberberg reports he received a letter from a vice-president of the US cable channel A&E, threatening various unspecified actions if he did not remove a promotional bag from his site. He responded by suggesting that the media might be interested in the story: "TV network sues barf bag collector". Sadly, A&E did not pursue the case. Thanks to Paul Mundy for the text. I publish it in solidarity with all persecuted bag collectors around the world.